PSForce.com :: How do you do water in photoshop? How do you do water in photoshop? Posted: 15 Oct, 11:39 Post subject: How do you do water in photoshop? I want to have some water in a design I'm making but how do you make it look like water? What filters or layer techniques do I use. MOV is a file extension used by the QuickTime-wrapped files. QuickTime Content (.mov, .qt), developed by Apple Computer, is a file format for storing and playing back movies with sound. This flexible format isn't limited to Macintosh operating systems.The QuickTime (.mov) file format functions as a multimedia container file that contains one or more tracks, each of which stores a particular type of data: audio, video, effects, or text (e.g. for subtitles). mac rip dvd to .mov video converter can convert dvd to mov mac. It enable you to select any part of DVD titiles and chapters to adjust and merge into one file. Here is a step-by-step guide to teach you how to convert dvd to mov mac OS X.
First,if you want to mac convert dvd to .mov, free download and install dvd to .mov ripper for mac. Insert DVD into your DVD-ROM. Click "Load DVD" button to load your DVD. Just Click "Load IFO" button and press DVD folder or DVD IFO file. Use the “format” on the bottom of the window to control the output format. Click on the toggle to the right of the "Format" label to get format drop-down menu. 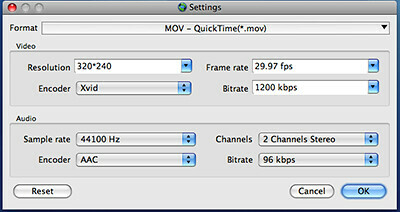 Forth, change mov video and audio settings in the progress of dvd to .mov mac. You can change the Resolution, Encoder, Bit rate and Frame rate of the dvd to mov video and Sample Rate, Channels, Encoder and Bit Rate of the mov Audio. The size of the mov file depends a lot on these settings. Expand the "Output" panel. Use the "Browse" button to select an output directory. Step 6: Click "Start" to convert dvd to mov mac. If you want to trim, crop, capture screen picture, merge several video clips on to one file and more editing, please go to how to edit videos with DVD to .mov Ripper on Mac.